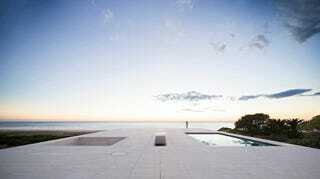 This is the House of the Infinite in Cádiz, Spain, designed by architect Alberto Campo Baeza. It looks like the sand actually solidified into the house itself. Simple straight lines, simple use of materials, large windows to watch ocean and make the breeze of the Bahía de Cádiz circulate through its interior. Just beautiful.